Alphabet Rockers were proud to offer hip hop arts programming in Glenwood Elementary School again this year. 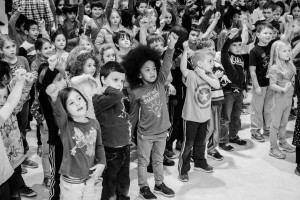 In a unique program design, we offered two assemblies (one in fall, one in Spring), along with accompanying dance workshops following each program. Principal Kim Goodhope understands the importance of equity frameworks – and was eager to see how this model would deepen the experience for the young people. We ourselves as artists were in the process of evolving our language, performance and messages to step up as allies and advocates for racial justice. 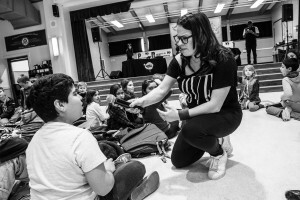 Earlier in 2017, we performed “Change the World,” with songs like “Gimme Some Skin” inviting young people to see and validate the diversity of skin colors in the room. We invited the audience to envision how they would change the world to make it more fair for all people. In our return visit this past October, we were in the process of developing a new concert series for the September released album, Rise Shine #Woke. Our music had changed. We had changed as artists. As a multi-racial group of artists, we had advanced our work from “Gimme Some Skin” into songs that talked about discrimination, and took action to interrupt our biases. When we went into the classrooms to unpack further, we knew that as a mixed-race group, we would hold different space. A white woman talking about skin color discrimination and a black man talking about skin color discrimination would hold different language, embodiment and throughlines for these classrooms, where the children were from various backgrounds but were navigating a mostly white school and community. We found that the work needed to root in identifying and celebrating difference, before we could address discrimination and advocacy. It was clear that the work we were aiming to accomplish would need further parallel resources in the classrooms and in the school culture. This album received a GRAMMY Nomination only a few months later; we returned with that glow to Glenwood in March. We performed our song “Walls” – about how folks who speak another language or come from another place are not always made to feel welcome. How can we be “the people” that we really want to be? How can we uphold those ideals of equality and equity at a time when we knew that even our own kids were feeling the pain of discriminating national policies and actions. Post concert, we went back into the classrooms, charged with a similar inquiry of unpacking discrimination and bias with our young people. 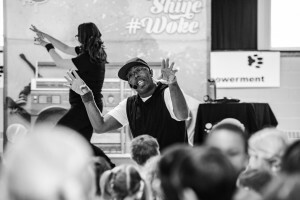 In one class, learning the dance moves to “Shine” empowered the children to feel their voices and bodies connected to bold claims of belonging. In another class, we reverted back to trying to describe our skin color, finding that the work around discrimination was still not quite sinking in. We went on a skin color match game, finding articles in the room that reflected our skin colors, from pages of an old book to a wooden clock. We then turned our skin color matches into unique handshakes, which celebrated the diversity and creativity of the students. What’s interesting to know in this path with arts and creativity is that it is not always linear. We do need to circle back, to revisit, to revise and listen. Just the same with adults – we cannot assume that one moment of learning around systems of oppression will lead us entirely to a path of truth and understanding. We are complex beings, seeped in our systems of bias and understanding. Our kids are as well. In our work at Glenwood, we are reminded of this openness. The principal brought us in with full understanding of the importance of equity. We will continue to support their work – and the students individual and collective journeys – as it is about true embodiment through the years.